We live our lives assuming the daily tasks, chores and encounters will be the high or low lights of the day. Our personal challenges occupy our thoughts and convince us that these are the greatest difficulties we'll encounter. When the phone rings with news that our child has died those previous difficulties melt away and we realize we never knew the true meaning of difficulty or loss..... Musician Eric Clapton discusses the loss of his son Conor. ERIC CLAPTON has recalled the heartache of losing his son CONOR in his new autobiography, revealing he had taken the four-year-old to the circus the night before he fell to his death from his mother's New York apartment. Clapton, who penned classic ballad Tears In Heaven after the 1991 tragedy, spent the night before his son's death enjoying his first father-son outing alone with Conor. "The phone rang and it was Lori. She was hysterical, screaming that Conor was dead. I thought to myself, 'This is ridiculous. How can he be dead?' and I asked her the silliest question, 'Are you sure?' "And then she told me that he'd fallen out of the window. She was beside herself. Screaming. I said, 'I'll be right there.'" Conor had fallen 49 stories from a high-rise window. 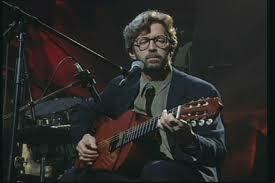 In his memoirs, Clapton also recalls the horror of having to identify his son at the morgue. He adds, "Whatever physical damage he had suffered in the fall, by the time I saw him they had restored his body to some normality. "As I looked at his beautiful face in repose, I remember thinking, 'This isn't my son. It looks a bit like him, but he's gone.'" Join us at A New Journey on facebook. Look for us at the member's only version of ANJ on facebook.